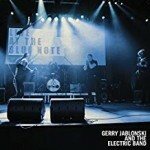 Share the post "Album review: GERRY JABLONSKI AND THE ELECTRIC BAND – Live At The Blue Note"
If ‘Live At The Blue Note’ evokes a Manhattan jazz club then the opening track ‘Sherry Dee’, from Gerry Jablonski And The Electric Band second live album in 2 years, quickly suggest otherwise. It’s a hard hitting boogie on which harp player Peter Narojczyk doesn’t significantly join the song until nearly half way through, while his first solo isn’t until the tension breaking 3.30 mark, all of which gives us an early inkling of just how confident the band is in their ability. And it’s their consistent reach for a meaningful performance that makes this release a good example of what great live albums used to be. Almost primal in its attack, it’s a celebration of what rocking blues can offer when a combination of the band’s essential drive, the crowd’s enthusiasm and the club’s vibe coalesce and are captured by Kamil Neumann’s cool set of ears and Leszek Luszcz’s pristine mix. The end result is a live album that finally nails the band’s bristling style 9 years after their debut album. GJB is very much the sum of its parts and is built on the impressive rock solid rhythm section of bassist Grigor Leslie and drummer Lewis Fraser. They both add harmony vocals and strike the perfect balance between real drive, frisson and nuanced dynamics. Blues harp player Peter Narojczyk is a blur of speedily delivered notes and bluster, who shifts effortlessly between underpinning a melody to filling a space with a solo or playing double lines with guitarist Jablonski. GJ leads from the front. He’s the kind of guitarist who mixes meaningful phrases with contrasting tone colours and has enough subtle tricks in his armoury to balance his natural exuberance with moments of deep emotion. Listen for example, to his attack on the big rumbling groove of ‘Black Rain’ which starts in faux reggae fashion and features two contrasting tone choices on an extended second solo. The band comes together telepathically, before he adds conversational guitar parts and rounds things off with some Roy Buchanan style chicken squawks. Then there’s his gnawing solo on the outstanding ‘Soul Sister’, a riff driven piece featuring a booming vocal, a high energy John Popper style harp break and a spiralling guitar solo over a tight rhythmic support. The song was released last February as the B-side of the ‘Heavy Water’ single which is a surprising absentee from the playlist here. Jablonski places his total trust in a band that lives for spark. It’s all there on the opening boogie of ‘Sherry Dee’, the locked in shuffle of ‘2 time Lover’ and when they simply rock out balls to the wall style on the stop-time ‘Fork Fed Dog’. The latter is also a great example of the way Narojczyk subtly slips from accompanist to soloist. Both Narojczyk and Jablonski consistently serve the songs throughout the album, while still searching for those inspirational moments when the band can take off. The funky feel of ‘Angel of Love’ is a perfect example, as Narojczyk’s propulsive ascending harp line leads into a hook with Grigor’s cloying bass line and Lewis Fraser energetic drumming. The whole thing sparks with blistering solos and seamless interplay on a tight outro with a perfunctory finish. You only wish there had been some ambient mics in the club to capture the full audience response. Having lit the fuse with ‘Angel Of Love’, the band ramp things up with the extended closing track ‘Broken Heart’, on which the blistering rock finish matches the spiky lyrics perfectly. Such is Jablonski’s intensity that having evoked Robert Plant with a stuttered vocal, he swears in his role as the song’s narrator, before a final drum crescendo gives the enthralled crowd its cathartic release. This entry was posted in ALBUM REVIEWS, ALBUM REVIEWS (Mobile), All Posts and tagged album, Gerry Jablonski, Gerry Jablonski And the Electric Band, Grigor Leslie, guitar, harp, John Popper, Kamil Neumann, Lewis Fraser, live, Peter Narojczyk, Polish, review, Robert Plant, Roy Buchanan, Scottish. Bookmark the permalink.